Catalunya GP FP2: Viva España! Conditions continued to be ideal as Free Practice 2 at the Gran Premi Monster Energy de Catalunya began for round seven of the MotoGP™ World Championship. Times remained steady for most of the session, the final ten minutes seeing riders fit new tyres for a couple of flying laps. Home hero Jorge Lorenzo (Movistar Yamaha MotoGP) began his quest for three straight wins in a near perfect way, setting a 1’41.712 to top Free Practice 2 and Friday overall. Lorenzo has only once finished outside the top two in the premier class at the Catalan GP, in 2014 when he was fourth. With his two title rivals outside the top five, Lorenzo could extend his championship lead beyond ten points if his form keeps up for the weekend. There were no signs of Maverick Viñales (Team Suzuki Ecstar) slowing down after topping Free Practice 1, the Suzuki man the first rider into the 1’41s. 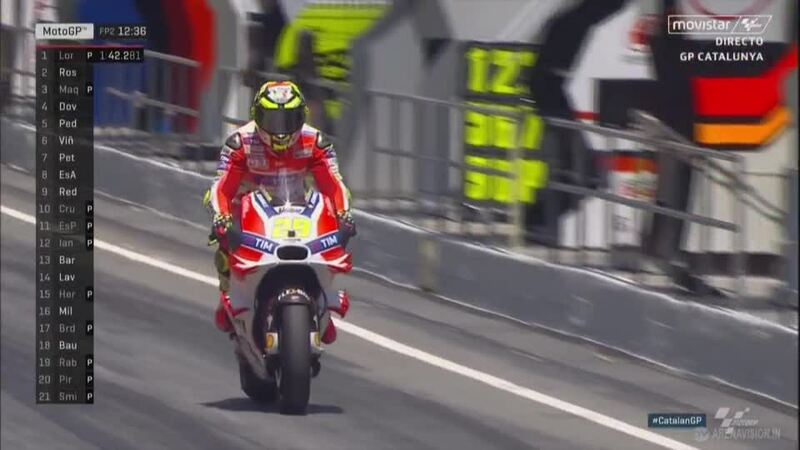 A best time of 1’41.954 would see him end the day 0.242s behind Lorenzo. 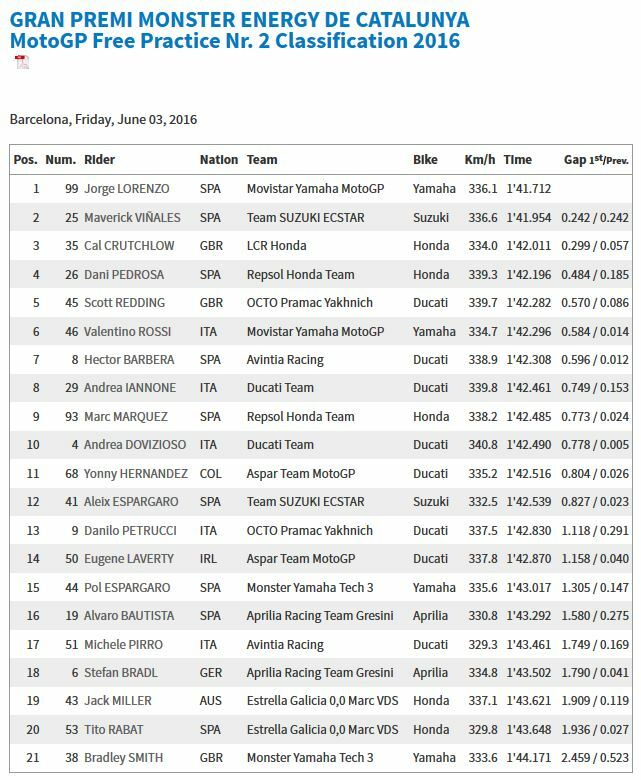 Suzuki’s work back at the factory is clearly working, Viñales ending ahead of all the Yamaha riders in terms of top speed, hitting 336.6 km/h during the session. Cal Crutchlow (LCR Honda) proved he still has the speed despite a tough start to the year, wrapping up Friday in third and as the fastest Honda rider. The Brit was 0.299s back on Lorenzo and only 0.057s behind Viñales. 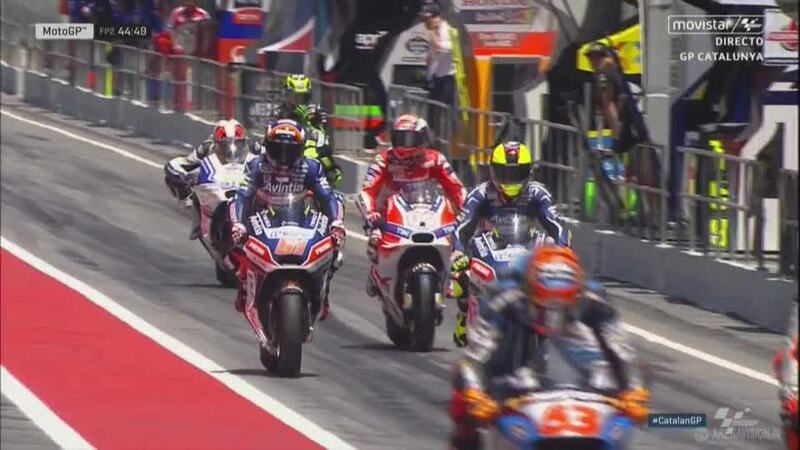 Not only was Crutchlow the leading Honda rider, he was also the fastest of the Independent Team riders. The Circuit de Barcelona – Catalunya is by no means one of Crutchlow’s best tracks, having failed to finish the last three races he has started there. But as the Brit has proved time and time again, he’s full of surprises and always capable of a strong result. Fourth was a dramatic improvement for Dani Pedrosa (Repsol Honda Team) who had ended FP1 down in 14th place, his time improving by over a second. Scott Redding (Octo Pramac Yakhnich) ended fifth overall, 0.570s off Lorenzo. 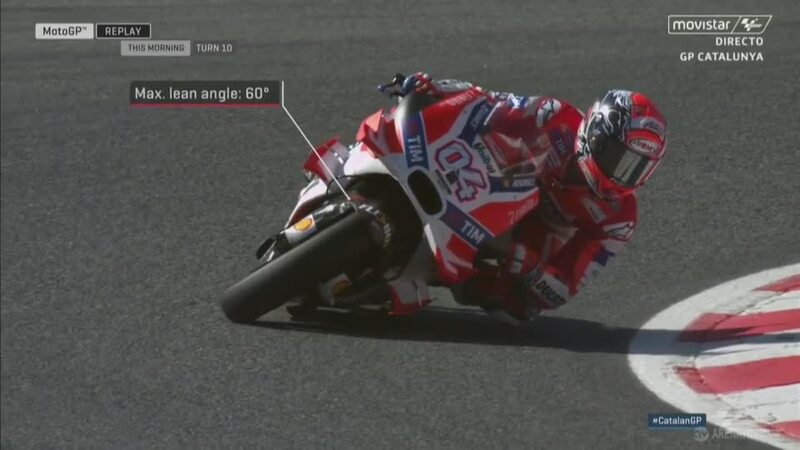 Redding was also the leading Ducati rider, both Andrea Iannone (Ducati Team) and Andrea Dovizioso (Ducati Team) taking a while to get up to speed as they ended eighth and tenth respectively. 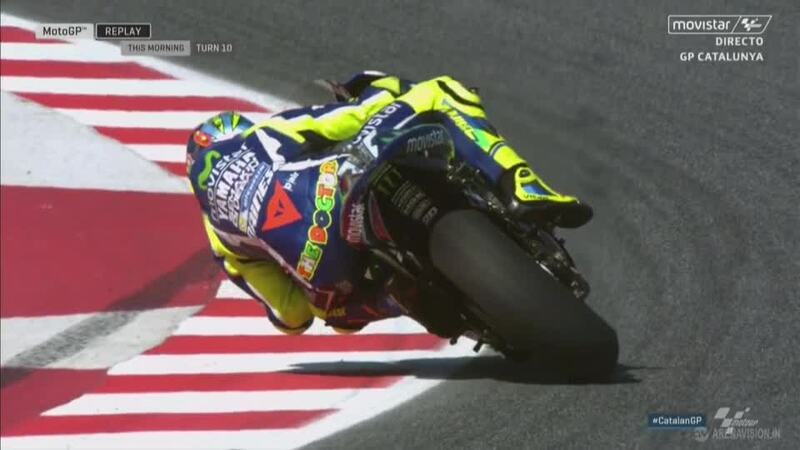 0.014s back on Redding was Valentino Rossi (Movistar Yamaha MotoGP), ‘The Doctor’ unconcerned by his position as the times were so close. 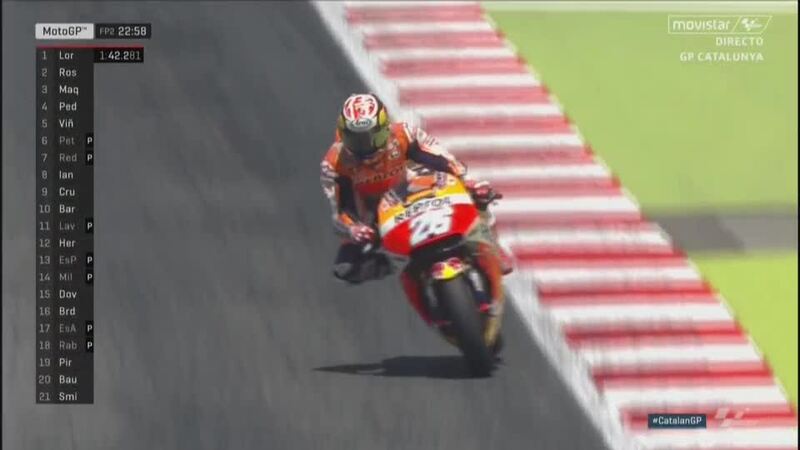 In contrast, Marc Marquez (Repsol Honda Team) and his crew have some work to do ahead of Qualifying as he ended the day down in ninth and 0.773s off the championship leader. Alvaro Bautista (Aprilia Racing Team Gresini) was an early faller in the session, coming off at Turn 1 on his fourth lap. 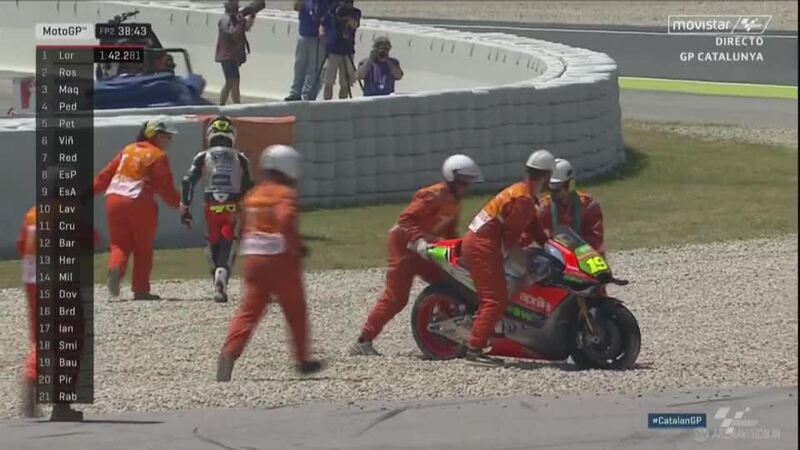 Jack Miller (Estrella Galicia 0,0 Marc VDS) had his second fall of the day, crashing at Turn 3. Both riders were unharmed.